Hyperloop Transportation Technologies (HTT), a US startup to revolutionize travel. — is the brainchild of Tesla founder Elon Musk, who opensourced the basic design in 2013 in the form of a white paper. Bibop Gresta, chairman of HTT post his talks with the Transport Minister Nitin Gadkari is looking for talks with Karnataka’s chief minister to sell the concept of hyperloop in the state. I came to India a few months ago and met transport minister Nitin Gadkari. We have a proposal on the table to run Hyperloop between Mumbai and Pune, he said. He goes on to say that it takes 6-8 months to do the feasibility study, and 38 months to set it up, from the date we get all approvals. We don't want government money. We only need the land and approvals. We will get private investors to build the system. Several Indian investors have already expressed interest, says Gresta. I read about the challenges of reaching the airport in Bangalore and it would be ideal for the state government to look at hyperloop technology to play a major role provided all end-to-end tasks are met, he said. "This tech takes less space and no destruction to the environment". Post his meeting with the minister, Gresta said he found the Indian government very interested. “If they put their money where their mouth is then we could see very quickly a hyperloop in this country.” The company has already signed deals to build a hyperloop between Abu Dhabi and Al Ain in the UAE. The Indian government has been focussed on improving the infrastructure in the country. PM Narendra Modi, in particular, has talked about bringing bullet trains to India. The first bullet train is expected to run between Mumbai and Ahmedabad and is expected to be built by 2023 at a cost of about $12 billion. But Gresta thinks bullet trains pale in comparison to the hyperloop system. He said bullet trains would be a big mistake for India. India has the potential to really embrace new technologies. Put $1 billion in hyperloop. And you have a faster, more efficient way to transport people. HTT uses a crowd-collaboration approach by roping in about 800 engineers and companies who are working for stock options. 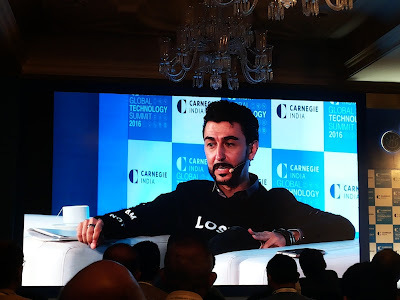 There are about 25 people from India working on the technology, Gresta said. The hyperloop will run on renewable energy. There will be solar panels on the top of the tube, wind turbines in the pylons and will generate more energy than we need,” he adds.